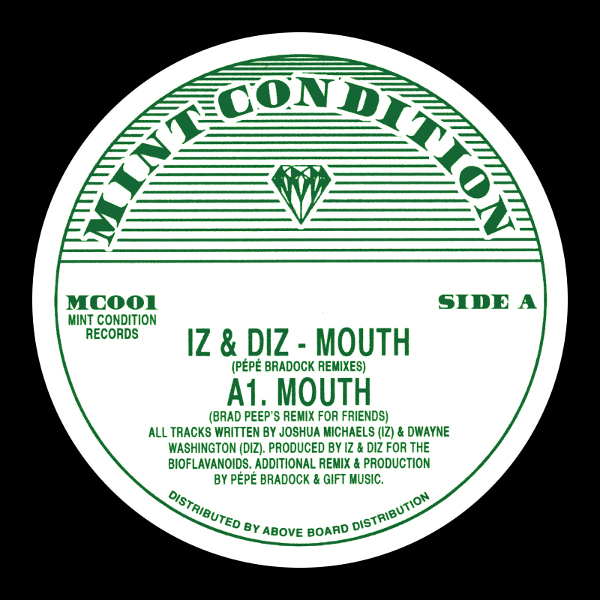 Iz & Diz's "Mouth" - Originally released on the seminal Chicago/London label Classic recordings way back in 2002 is a bonafide benchmark of modern House music, on it's release the records original flavour was a welcome breath of fresh air (pun intended!). By signing up the French genius Pepe Bradock on remix duties Classic had on their hands a future anthem. Bradock's singular, fresh production style pushed the track into the imaginations of numerous DJ's and ensured the track would find it's place in the bags and mixes of heads for years to come. Still sounding totally alien today with it's mix of human sounds twisted through digital treatments, Mint Condition are extremely proud to unleash these cult remixes backed with the unheard, unreleased versions and takes from the Pepe Bradock remix sessions for their debut release. Across 3 tracks we get to sample the wigged out funk from the deepest recesses of Pepe's mind, his chopped up vocal samples and intricate percussive elements coming off sounding like Todd Edwards on acid and still sound completely new/insane today. In a sense MC001 is the "complete" package, the entire picture of "Mouth". Most of the versions included here have never been released before and have long been the stuff of legend! (watch out for that acapella!) An essential slab of wax for those who know, and for those who are seeking sonic adventure! Presented here are the full versions, dubs and alternative mixes of this monster remix. Dug, remastered, repackaged and brought to you by the caring folks at your new favourite reissue label - Mint Condition!